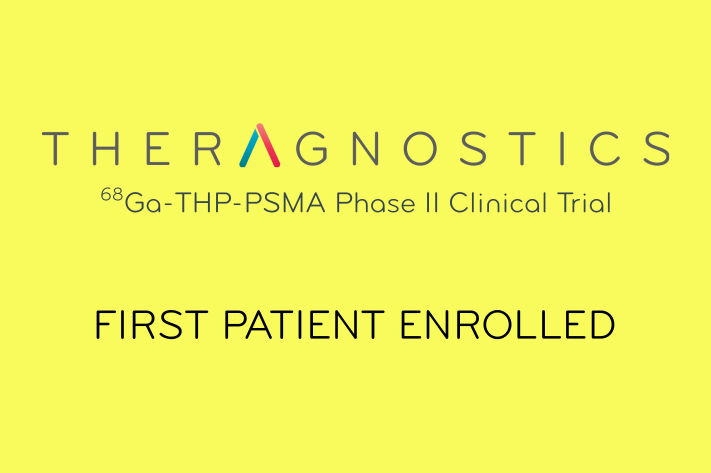 Today we announce the enrolment of our first patient in our Phase II open label clinical study of 68Ga-THP-PSMA . The study will assess the safety and clinical utility of 68Ga-THP-PSMA PET/CT in patients with high risk primary prostate cancer or biochemical recurrence after radical treatment. “This is the most advanced Ga-68 PSMA radiopharmaceutical PET kit being evaluated prospectively. This revolutionary technology generates high yields with a single isomer within minutes under mild conditions enabling the delivery of more doses over greater distances, thereby widening access of PSMA PET to prostate cancer patients. Today is a significant step towards our goal of transforming patient care and an exciting milestone for the company.” Greg Mullen, CEO of Theragnostics Ltd.
More information about the trial can be found on clinicaltrials.gov here.